There are so many wonderful enotecas in Rome but Il Goccetto remains my go-to, no matter the season. 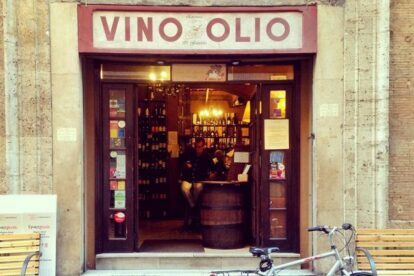 It might be the cute “Vino e Olio” sign that hangs outside, or the fact that bottles of wine line the walls from ceiling to floor, or the appeal of a place so popular that people spill out of the bar and onto the street to sip their wine propped up on vespas outside. When I’m in the neighborhood I can’t help but stop by for a glass of wine and a snack. Il Goccetto (which means “the little drop”) opened in 1983 and is one of the oldest wine shops in Rome so the atmosphere is delightfully quaint and old-fashioned – the interior has painted wooden beam ceilings, warm lighting and shelves upon shelves of wine. The space is quite small and intimate so if you want a table you should show up early. There are 2 dozen options for each red and white wine listed on a chalkboard behind the counter and various options for sparkling wines or other spirits. Il Goccetto naturally also has an extensive inventory of wines by the bottle (primarily from Italy and France) if you are looking for something more particular. You’ll want to pair your wine with some food and the enoteca has delicious deli items including cheeses, cured meats, pickled vegetables and my favorite, their tiellas (rustic savory cakes typically from Gaeta). Open for lunch and in the evening.